OdorXit Safety- Eliminate Surface & Fabric Odors Safely, and For Good! OdorXit Odor Eliminator and OdorXit Magic is guaranteed to remove odors and are safe enough to use anywhere in your house, car, boat, place of work, your washing machine, and many other places. Even with a non-toxic formula and proven effectiveness, OdorXit Products still need to be used properly as outlined on this web site so that they produce the desired effect while posing minimal risk to humans, animals, or the environment. All chemicals (including water) have some level of exposure to humans and animals that will be toxic to some extent. The difference is that OdorXit Products, especially Concentrate and Magic require very high levels of exposure to become even mildly reactive or toxic to most people and animals. Using all OdorXit Products as directed will guarantee a safe, and odor-eradicating experience. you have more questions, call our OdorXit Toll Free Help Line: 877-ODORXIT or 877-636-7948. OdorXit as packaged, is highly concentrated. For most applications one 16 ounce bottle of OdorXit will make 2 gallons (256 ounces) to 4 gallons (512 ounces) of solution. Refer to the Application notes section of this document for detailed application procedures and equipment. 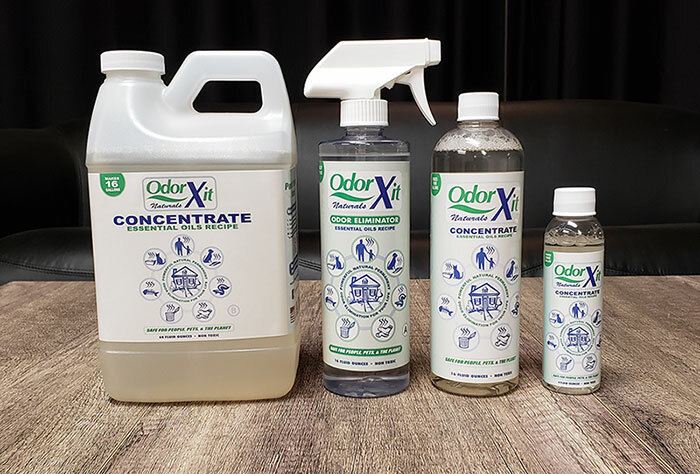 OdorXit Concentrate diluted with water can be safely applied directly to carpeting, flooring, walls, furniture, bathroom tile, cabinetry, concrete, hands and many other surfaces to eliminate odors. See the Taxidermy section for even more uses. It can also be used in combination with carpet cleaning and laundry detergents (not bleach) for one step cleaning and deodorizing of carpet and fabric. Normally, OdorXit solution is sprayed on with either a trigger sprayer or a 1/2 to 2 gallon yard sprayer (see Applicators). It can also be applied as a solution of OdorXit and water or in combination with detergents in a carpet-cleaning machine for large carpeted areas or with a washing machine for fabrics small enough to fit into the machine. OdorXit is fully compatible with detergents and germicides. It works well at any temperature above freezing. OdorXit eliminates odors that remain and continue to emerge after application of a germicide. OdorXit is a non-toxic, non-irritating, non-flammable, non-carcinogenic, non- staining solution and is also biodegradable. When treating urine, gives off no unpleasant and possibly harmful ammonia gas. Conforms to the RIFM and IFRA guidelines. It is not a primary skin irritant, nor toxic by oral ingestion or by inhalation. In concentrated form, may be a minor irritant when in direct contact with the eyes but is non irritating when diluted according to directions. In concentrated form, avoid open flame. If exposed to concentrate, eyes should be flushed with water. OdorXit uses no bactericide, enzyme, oxidizer, olfactory desensitizer or masking scents. When OdorXit comes in direct contact with odor causing agents it neutralizes the agent. OdorXit uses a complex and proprietary mixture of water soluble organic salts and oils to create a unique 3 part contact chemistry: Counteraction. It pairs with many odors to neutralize the odor. Absorption. Physically penetrates many odor causing substances and converts them into other byproducts that have no odor. Bonding. Physically binds to many odor causing substances changing them for ever into non odor producing byproducts. OdorXit is listed by the U.S. Department of Labor's Material Safety Data Sheet (MSDS) as being a minor eye irritant when in concentrate form and non-irritating when diluted according to directions. Regardless of what the MSDS says or the Dept. of Labor thinks, OdorXit is a mixture of organic salts and oils that by their very nature have a small but not zero potential to cause allergic reactions in humans and pets. If any unusual reaction occurs, consult a physician immediately. Listening Systems Inc. will make every effort to supply any additional requested information.